Could you trust a God Who destroyed a nation before your eyes? Would you want Him as your friend? Experience God through Israel’s Exodus from Egypt’s power through those who were there. The Place: Old Kingdom of Egypt. His power touches all people. Some don’t concede. They suffer. brings all to see the one true God. The world knew that He was the Lord. 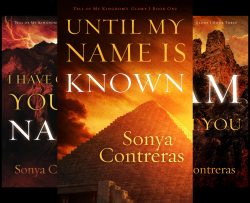 Book One of Tell of My Kingdom’s Glory. 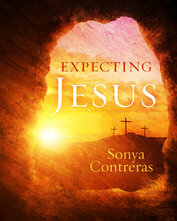 Sonya Contreras does an amazing job of weaving the biblical account with archaeological and historical records to tell the story of the Hebrew exodus from Egypt. In reading this book I have a deeper understanding of the pain and sorrow of the Hebrews while seeing the mighty hand of God and His glory. What a great read! It was very interesting, exciting and so powerful. This book gave me a better understanding of the pain and suffering of the Hebrews in Egypt. The plagues were described so vividly that I could actually visualize them. What a wonderful book! It was exciting while adding to my knowledge of God's power and His glory. I'm looking forward to the continuing book. I received no payment except a free book. 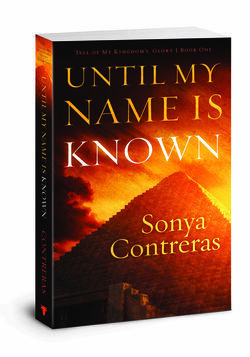 Until My Name is Known gives a clear and compelling picture of God's movement in the Old Kingdom of Egypt with the return of Moses to Egypt as God's faithful messenger and servant. The story unfolds as Moses faces Pharaoh with God's instructions to " Let My people go!". The author gives readers insights into the lives and thoughts of both Egyptians and Hebrews as each of the richly drawn characters respond to God's power evidenced in the various plagues. Some struggle against the One True God and some find their faith in His love growing deeper. Every reader will find both comfort and challenges as the results of the plagues affect lives of individuals and the nation of Egypt. 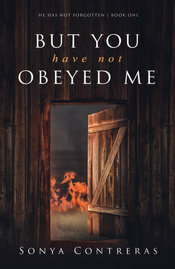 As we learn more about God, will we obey, or will we rebel? This question pervades the book -- and each of our lives. I have read scores of Christian fiction books and this is the first clear instance of God Himself being the main character of the work. If you are fascinated by history --- read it. If you want to spend hours experiencing life in Old Egypt--- read it. If you want to know more about the Holy God -- read it!!! I received no payment for this review except a free book ( which I will treasure). In Until My Name Is Known the Almighty sets out to reveal Himself to mankind. He takes both the Egyptians and the Hebrews from “Who is this God, that I should obey?” to “Surely this is the finger of God!” The great I Am clearly unveils His character, but wisely allows each one to choose whether or not they will honor His supremacy. Reading this account helped me step out of modern America into Egypt, 2450 B.C. and brought the Biblical Exodus to life. 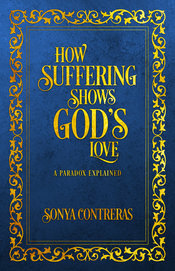 I think you, like me, will be uniquely compelled to view God through the eyes of the story characters as they stand in awe of His mighty miracles, wonder at His patient persistence, and grapple with questions about fairness and faith. 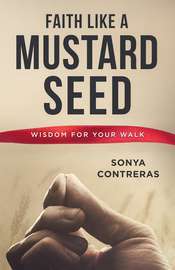 I want to thank the author for the privilege of reviewing her book—I enjoyed it enough that I chose to purchase my own copy rather than accept the complimentary reviewer’s copy.